The diminutive Peter Gethin provides a good quiz question in that while he won one grand prix in his 30-race career, he never actually led a race for an entire lap. His success in Italy in 1971 was remarkable; he stormed through from fourth going into the final lap to win by a wheel, recording the fastest average speed in F1 history (a record broken by Michael Schumacher 32 years later). It was his only podium finish. 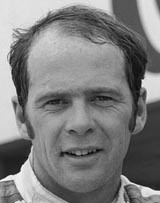 Gethin won the Formula 5000 Championship in 1969 and 1970, and also raced for McLaren in 1970's Canadian-American Challenge Cup, winning one of his three races. His early promise in a dozen F1 races was recognised by BRM, which signed him near the end of the 1971 season. It proved inspired in the short-term as the win in Italy was only his second outing for them. However, 1972 was disappointing in a weak car and he only finished two races, failing to make it past 23 laps in any of the others. He started 1973 well, winning twice in one weekend in March - a Formula 5000 race on a Saturday and a quasi-F1 race, the Race of Champions, on the Sunday, beating a field of F1 cars in his Formula 5000 Chevron. He continued in Formula 5000 until given a chance by BRM at the end of the season; but he again suffered from mechanical failures. In 1973-74 he raced in the Tasman Series, a Formula 5000 event in Australia and New Zealand, driving a Chevron he won the 1974 championship. That year also saw his last F1 outing as a replacement for injured Guy Edwards. It was a wretched finale - he was forced into the reserve car of Graham Hill at the last minute but found he couldn't reach the pedals so had to retire. He remained in Formula 5000 until 1976, before he moved into management. In 1984 he was appointed team manager of the Toleman F1 team and then went back to Formula 3000 to set up Peter Gethin Racing in 1986. In the early 2000s Gethin ran a driving school in Goodwood before retiring. He died in December 2011 following a long illness.